This is the final article in this part of the series on making money in the betting industry and I will only give two ways of making consistent money here, because I want this to be the last article on sports betting. The others will be in the ebook. How to NEVER lose money betting. A. You must use and combine betting signals. ALL professionals use sports betting systems developed and programmed specifically for that purpose, either personally or by others. They set up models and computer system, softwares that do a whole lot of permutations and combinations in order to make the right decision as to who will win the game/match/tournament/competition, etc. Now I will take my time to explain this because it is a very important aspect of ANY and ALL ONLINE TRADING, be it sports betting, stocks, mutual funds, Forex, indexes or options, etc. This is how it works. When you trade, you are trying to predict a future event. And your success lies in your ability to make as accurate a guess as possible. So you need all the information you can get in order to be right. In business/management decision-making generally, you have to have all the information necessary (as fast as possible) in order to analyze and come up with the right decision. But since you don’t have the wherewithal to set up the processes or softwares or personnel, they (the signal providers) will charge you monthly. Most of them offer a free trial of 7-30 days that is free or about $5 or more. Research more about them and follow any that you are convinced about. (1) Sportsbettingprofessor.com by Rich Allen. This is undoubtedly one of the very best as it features on every review list I found! (3) Docsports.com (have up to 10 different signals you can subscribe to), and they have their own review of all the best signals here. (4) Sportscashsystem.com by Tommy Krieg, a Mathematician. (5) Zcode betting system. A great system, but costly, though they recently sent me a mail that subscription is now only $49 (discount). You can take advantage of this. (6) Sports betting masters will give you a one-year membership for $197 which is a 60-day money back guarantee. But I am not a subscriber anyway. You can also check this link for yet another review of some top betting systems. Following a paid system is also like following a proven tipster on popular tipster sites. The only difference is that you are paying for the system’s claim of past success and the name they have put on it. They give you the exact bet to place, the line at which you should bet, and the amount you should wager. What I advocate is at least 3-4, you can choose 2 very good paid subscriptions (if you can afford it), and then 2 free signals/tips in your chosen sports. Then, combine that with your own research and place sure bets. I wish you all the best using this method. The second method is arbitraging. I will give some explanations too, please patiently go through it. B. Arbitrage betting: Arbitrageurs or Arbers are the professionals who engage in arbitrage betting. Arbitrage betting in sports betting is an activity where you simultaneously place bets on all possible outcomes of an event at odds that guarantee profit, whatever the result of the event will be. These bets are also known as surebets, miraclebets,surewins or just arbs. Normally, placing bets on all outcomes of an event at single bookie would result in guaranteed loss. However, if you take the best odds from different bookies, it is possible to make guaranteed profit. Most sports events have just two possible outcomes- win or loss (tennis, American football, basketball, hockey-no draw) or three possible outcomes (football -where draw is possible). You can make anything between 0.2% and up to 20% per arb trade. But these opportunities occur within minutes, and you have to be vigilant and fast to utilize them. Look at this example of an event with two possible outcomes. As you can see above, a correctly staked investment of $1000 guarantees a return of $1090.38 whatever the outcome of the match will be. That means $90.38 guaranteed profit because of the differences in the bookies' odds on a single bet. You can see that Bwin had odds of 1.36 for Djokovic to win the match, while Pinnacle had odds of 5.5 for Nadal to win the match. By applying simple mathematical formula we were able to calculate that we can cover both possible outcomes of the bet and make a guaranteed profit. The amount to invest on each outcome is calculated using another simple formula. $801.75 invested on Djokovic returns $1090.38 and $198.25 invested on Nadal returns also $1090.38. For a 3-way calculation, In order to get arbitrage percentage, profit and individual bets for a three way arbitrage you need to make the same calculations as for a two way arb. The only difference is that a three way arbitrage has three possible outcomes. These arbs are usually found in football matches where the possibility for a draw exists. Different individual bets calculations: Let’s see the calculations if you have been limited at one bookmaker involved in the arb, or if your money there isn’t enough. And let me show you the calculation if you want certain winnings. The basic calculation that is necessary to make all other calculations is to divide individual arbitrage percentages with total percentage. By doing this you actually calculate how much percent of the total investment amount you need to place on each outcome. We are still using the example from above. Using these percentages you can calculate individual bets for certain total investment, winnings or you can calculate the remaining bet(s) when you have been limited by one bookmaker. By multiplying total arbitrage percentage with wanted winnings we actually got total investment amount. After that it is easy to calculate individual bets. If you had placed $238.11 on Barcelona to win at Pinnacle Sports, $85.92 on Real Madrid to win at Intertops and $131.52 on a draw at William Hill, you could have secured winnings from $499.78 to $500.05 and made surebet profit from $44.23 to $44.50. When you divide individual bet with percentage that bet makes up in total investment you get total investment amount. By using remaining two percentages you can figure out other individual bets. As you can see if you had placed $452.63 at Pinnacle Sports on Barcelona to win, $163.32 at Intertops on Real Madrid to win and $250 at William Hill on a draw, you could have made profit from $84.05 to $84.57. Finding arbs can be done in several ways. 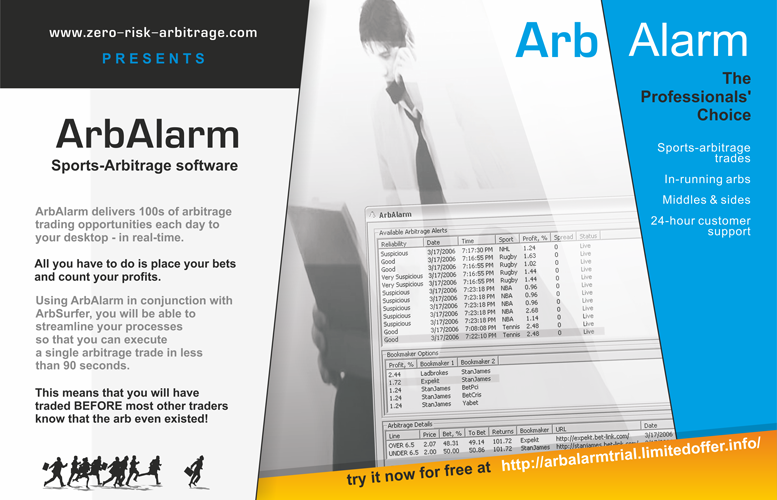 · Find arbs by yourself - Look at betting sites and odds comparison sites to find the best arbitrage opportunities. You should look for bets with two possible outcomes and the highest odds for the favorite and for the underdog at two sportsbooks. · Find surebets at messageboards - You can find a lot of messageboards where arbhunters notify each other about available arbitrage opportunities. The problem with this method is that the most of the arbs will be outdated. You can personally find surebets here. · Buy arbitrage trading software or register at arbitrage alert service - This is the only option you will have to pay, but you should seriously consider using sports arbitrage software. It can significantly increase your arbitrage profit, save you a lot of time, keep arbitrage trading free of unnecessary risks and make it incredibly simple. But they are pretty expensive, but why not for something that will give you up to 15% returns per trade. Arbitrage betting software or alert service saves you a lot of time and maximizes your profit, but you shouldn't buy it before you have opened accounts with bookies and done some small stakes trading. You will have to pay for arbitrage software subscription or alert service every month and these services are a bit expensive for arbitrage beginners, so you should get accustomed with your bookies first and do some trading with small stakes which may take you a few weeks. There are a couple of arb betting softwares and alert programs. They include “Arbets”, “Rebelbetting”, “Arbalarm and Arbsurfer”. Compare the 3 softwares here. The best software for arbitraging seems to be rebelbetting software, but Arbets is a cheap alternative I recommend you start with especially if you are a beginner. ArbAlarm is the most advanced for expert arbers. You will need up to N250,000 to start a successful arbitrage investment with Rebelbetting, and you will need to open a Neteller account (Skrill doesn’t allow Nigerians yet) because you will essentially be transferring money between accounts. Not all bookmakers favor arbitraging. Some bookmakers like bet365 frown at it. So there it is, "How to make money in sports betting". I hope I was able to open your eyes to the opportunities that abound in making money in sports betting when you see it as a 'trade' and not just as gambling. We will continue in this series with how you can make money from competitions, and how to get free courses or scholarships online.